Now that the Federal Reserve’s monetary policy meeting and U.S. non-farm payrolls reports are behind us, investors can focus solely on Tuesday’s U.S. Presidential election. Friday’s U.S. jobs report failed to change the market’s expectations for a rate hike in December. A total of 161K jobs were created in October but September job growth was revised higher, the unemployment rate dropped back below 4.9% and average hourly earnings rose 0.4%, which was more than expected. But the only thing that matters next week is who becomes the next President of the United States. Economics and monetary policy will take a back seat to the unfolding political drama especially since there are no major U.S. economic reports on the calendar. Over the past 2 weeks we have gotten a taste of how equities and currencies could trade if Donald Trump becomes President. On November 1st, when a poll suggested that Trump led Clinton by 1 point, the Dollar index dropped 1%, the Mexican Peso fell 1.75% and the Swiss Franc soared 1.4%. Investors took the U.S. dollar lower against all of the major currencies as the race tightened and the polling gap between Donald Trump and Hillary Clinton closed. As shown in the chart below, USD/JPY has been taking its cue from Real Clear Politics’ 2016 Presidential Poll Average Value for Hillary Clinton (white line) – a similar relationship can be seen with the dollar index. 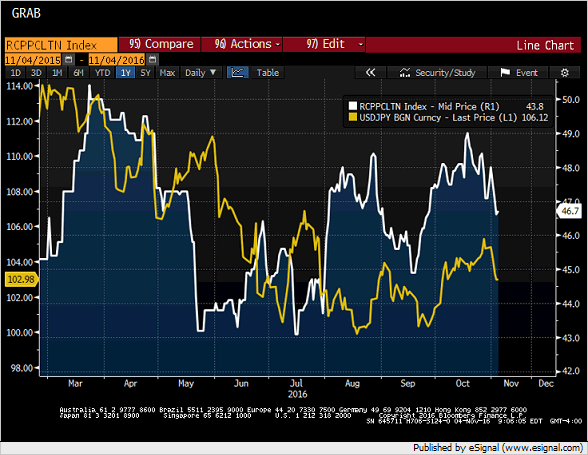 In the past 3 months when Clinton’s popularity rises the U.S. dollar strengthens and when it falls (like it has been recently), USD/JPY crashes. U.S. elections don’t normally elicit major market volatility but the problem in 2016 is that for better part of this year, market participants did not consider a Trump victory realistic and now that the election is too close to call they are bailing out of U.S. assets and rushing to protect their portfolios. Regardless of your political leanings it is hard to ignore the fact that investors fear a Trump Presidency. His foreign policy, trade ideas and plan to overhaul the Federal Reserve scares domestic and foreign investors alike and the general lack of specificity could mean a long period of uncertainty. Beyond the immediate impact, investors also worry that if markets sell-off and the U.S. economy slows the Fed could forgo a rate hike in December which would exacerbate the slide in the dollar into yearend. Scenario #1 –Trump becomes President, Clinton accepts defeat. The greatest market impact would be a Trump victory and a willing Clinton defeat. In this scenario, the U.S. will have a man with untested political skills and unknown policies in office. In this case, the biggest winners will be the euro, Swiss Franc and Japanese Yen and the biggest losers will be the U.S. dollar and Mexican Peso. The Canadian dollar should also fall but its moves could be tempered by a weakening U.S. dollar. The greatest relief for foreign investors would be if Clinton becomes President and Trump willingly accepts defeat. She’s not without her own problems (and there are many of them) but the transparency of her policies and the continuity of stability would send the U.S. dollar sharply higher. In this scenario, the dollar and peso would rise against all of the major currencies with the biggest losers being the Japanese Yen, Swiss Franc and to some degree the euro. However she would need to win by an uncontestably wide margin and Trump would need to accept defeat, which he has suggested that he wouldn’t. Scenario #3 –Trump/Clinton becomes President by narrow margin. Loser refuses to accept defeat. The third scenario is the most likely one. If Trump or Clinton becomes President by a very narrow margin and the loser refuses to accept defeat, the ongoing uncertainty would be extremely negative for the U.S. dollar, especially in the hours after the election. On a percentage basis, the greatest market volatility in financial assets (currencies, equities and commodities) will be in scenario 1 and 2. There’s almost no point in discussing the outlook for other major currencies as next week’s price action will be dictated solely by the market’s appetite for U.S. dollars. However, the Reserve Bank of New Zealand has a monetary policy announcement and a rate cut is expected! There have been as much improvements as deterioration in New Zealand’s economy. Employment growth was strong, dairy prices increased and business confidence is up but the central bank’s main concerns are inflation and trade – both of which have been falling. Cooler housing activity could give them the breathing room to cut rates. The RBNZ rate announcement is after the U.S. election so the market’s reaction could affect their decision. It’s a close call and even if the Reserve Bank keeps policy unchanged, they will repeat that rates are coming down. This stands in sharp contrast to the outlook of the Reserve Bank of Australia who left rates unchanged this past week and issued a statement with a relatively optimistic tone, sending AUD sharply higher. Australian data has also been good with retail sales rising, the trade balance narrowing, service and manufacturing activity accelerating. The only big miss this past week was building approvals. Chinese PMI reports was also better than expected which helped to boost AUD and NZD. There are no major Australian economic reports scheduled for release in the coming week but traders will be watching the latest trade numbers from China to see if the decline in import and exports eased in the month of October. The Canadian dollar traded in a very narrow range this past week until Friday when it hit a fresh 7 month high on the back of significantly weaker trade data and mixed employment numbers. Although 43.9k new jobs were created in the month of October, all of the job growth was part time with fulltime jobs falling by -23k. Not only did this erase all of the past month’s gains but it reflects a worrying shift in the labor market with companies hiring only part time workers. The trade deficit hit a record high as exports fell 1.2%. The weakness of the Canadian dollar is not having any positive impact on trade activity, which reinforces central bank Governor Poloz’s concerns. Falling oil prices also added to the pain. Earlier this week Poloz said the downside risks seen in September have crystalized and suggested that they can’t understand some of Canada’s export weakness. The currency has fallen over 5% since its peak in June and yet there has not been a meaningful pickup in exports. Poloz will be speaking again in the coming week and we doubt that his outlook has changed. Sterling extended its gains beyond 1.25 as the momentum from the British High Court’s ruling continued. Between their decision and Governor Carney’s optimism, we now expect further gains in the currency as traders unwind their short positions. U.K. industrial production and trade balance are scheduled for release next week but these reports will matter little to a market focused on the U.S. election and risk appetite. The same is true for the EUR/USD. Traders sold euros aggressively last month and as the polls began to narrow, they realized they had to de-risk their portfolios and to do so they unwound their EUR/USD short positions, taking the currency pair sharply higher. In the coming week, we have German industrial production and trade numbers scheduled for release and the lower euro should help these reports but nothing matters more to the euro or any of the major currencies than the outcome of the U.S. Presidential Election.